Leading the province is a very serious job, but Rachel knows how to let loose with a playful jab or two. Jason Kenney found himself in hot water over comments that women don’t understand “tactical politics” as well as men. 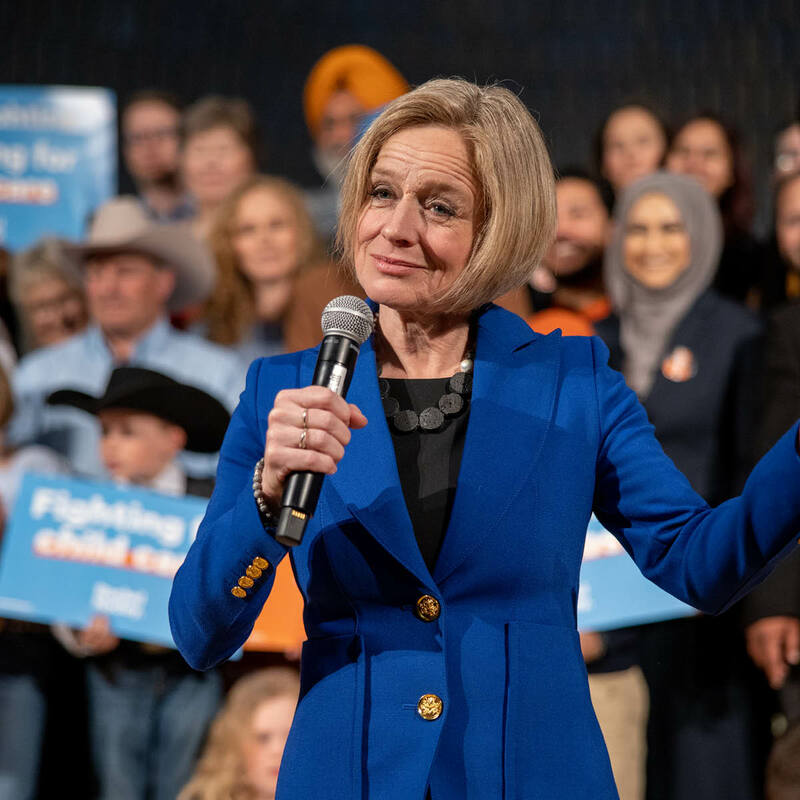 His awkward quip spawned a hashtag – #tacticalwomanab – which celebrated strong women making a difference in Alberta politics. Combine that with recent news about a secretive video shot by Kenney’s office, and voila! Jason, Alberta’s largest-ever female caucus and our 10 female cabinet ministers are available to provide you tactical political training any time you need it. You won’t even need to secretly film it. Here's another gem. To “avoid mockery and innuendos” UCP staff placed black tape on a “6.9m” traffic sign outside a campaign announcement, and CBC captured the moment. Online giggles ensued. Skipping Balzac, Cochrane and Two Hills, Rachel wondered what might happen to a town near where she grew up in northern Alberta. In addition to being an avid runner, Rachel is an equal opportunity joker. So when the time came to call an election, she couldn’t help but work in a friendly dig at her Calgary running buddy. To be fair, the pace of a campaign is a lot faster than a slow jog! My day started with a run with Joe Ceci. After that, the pace picked up a bit. From calling the Lieutenant Governor to announcing the election, it was a busy morning. The UCP has vowed to put Alberta’s curriculum updates “through the shredder” even though some of the lessons currently on the books predate the internet. Drew Barnes, the UCP finance critic from Medicine Hat, found himself wearing a dunce cap after he gave 110% in a post about what gets a “passing great.” Having been lectured a time or two on numbers during a previous election campaign, Rachel could only bite her lip so hard. Fine. I’ll say it. Math is hard....#Tacticalmath? Rachel Notley has fought hard to build the Trans Mountain pipeline, travelling the country to build support for a project in the national interest. For years, governments in Ottawa have failed to get a pipeline built. So when Prime Minister Justin Trudeau said his heart went out to Albertans struggling with a massive price differential, Rachel replied with a slow burn. While Rachel Notley is pretty darn good at using humour to make a point, she's not taking this election lightly.